Huawei has launched the follow-up devices to its popular flagship P20 series. The new Huawei P30 and Huawei P30 Pro were unveiled at an event in Paris yesterday afternoon (full event video) and these smartphones are said to build on the "Huawei P Series DNA in design and photography" and offer the company's most advanced series of smartphone cameras yet. Highlights of these devices' imaging specifications are the inclusion of; Huawei SuperSpectrum Sensor, an optical SuperZoom Lens, a new Huawei Time of Flight (ToF) Camera, and enhanced optical and AI image stabilisation technology. The Chinese smart devices maker is really pushing the photography angle, and it is indeed a popular and important function of today's smartphones, with many now eschewing compact cameras for the smartphone with editing and instant sharing appeal. 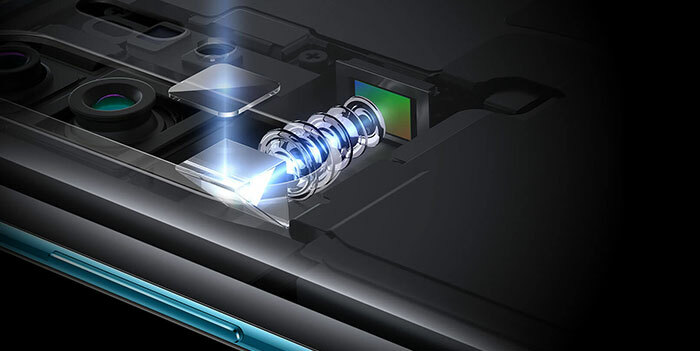 "The Huawei P30 Series is a fundamental breakthrough after decades of digital camera technology development; it will rewrite the rules and reshape everyone's perception of mobile photography," asserted Richard Yu, CEO of Huawei Consumer BG, yesterday. Furthermore, the video above starts with the voiceover announcement that "this is not a phone, it is a super-camera phone". 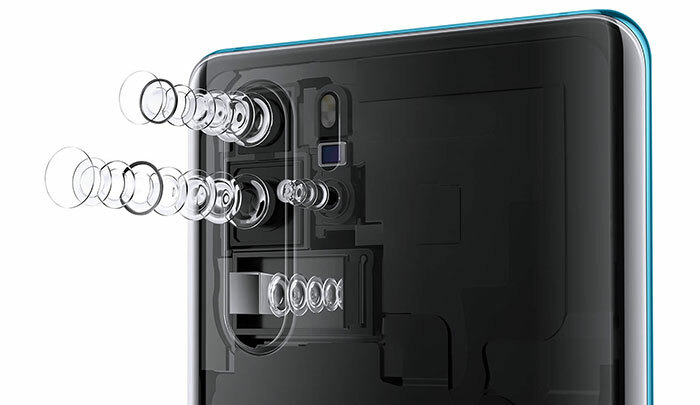 The new Huawei P30 Pro comes packing a new Leica Quad Camera System, including a 40MP main camera with the Huawei SuperSpectrum Sensor, a 20MP ultra-wide angle camera, an 8MP telephoto camera, the Huawei ToF Camera. Meanwhile on selfie-duty there is a 32MP front facing camera. Huawei's SuperSpectrum Sensor is 1/1.7-inch in size and employs RYYB pixels boosting the maximum ISO rating to 409,600 on the Huawei P30 Pro and 204,800 on the Huawei P30. 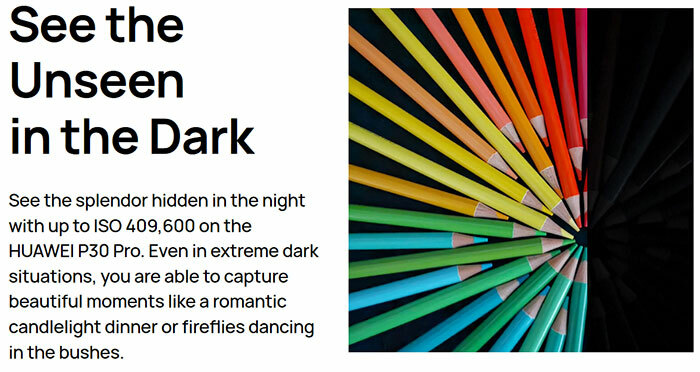 Additionally the AIS, OIS, and f/1.6 wide lens perfromas even in "extreme low light" yielding images with detail colour and clarity in these low visibility conditions. SuperZoom functionality uses a periscope style optical arrangement to keep the smartphone slim, and will provide 5x optical zoom, 10x hybrid zoom, or up to 50x digital zoom. Meanwhile the Huawei P30 Pro contains a ToF Camera that captures depth-of-field information to deliver accurate image segmentation. This precise distance measurement enhancement allow for enhanced portrait modes and multiple levels of bokeh depth of field effects. Lastly the sensor and imaging data is fed through Huawei AI to compose a 'perfect shot'. If you want to see a thorough review of the P30 Pro's camera it is worth a look at the DXOMark review. It is now the number one ranked phone on the site, which is an impressive feat and it is compared against the Apple iPhone XS Max and Samsung Galaxy S10+ in photographic capabilities. There are plenty of video unboxings and reviews available now too. 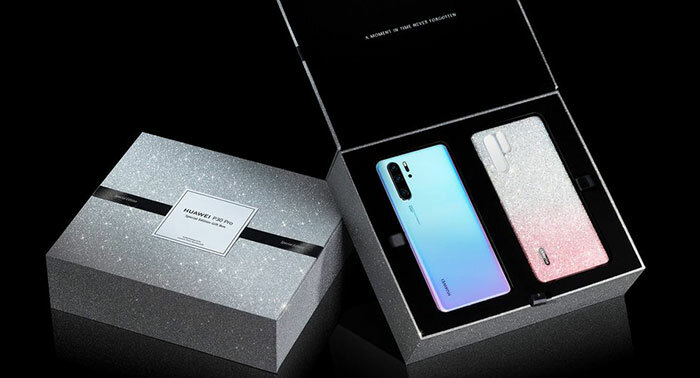 The 6.47-inch Huawei P30 Pro and 6.1-inch Huawei P30 come in Breathing Crystal, Amber Sunrise, Aurora, Pearl White and Black colours. Both devices feature a FHD+ (2340x1080) Dewdrop Display with a tiny notch for the front facing camera. The near bezel less design utilises an in-screen fingerprint reader plus Huawei Acoustic Display Technology (screen = speaker). In an email to HEXUS, Huawei provided the following prices for the new smartphones; Huawei P30 128GB is GBP 699, Huawei P30 Pro 128GB is GBP 899, Huawei P30 Pro 512GB is GBP 1099. These devices are available globally with immediate effect. Over the last few hours I have received emails from UK mobile networks and resellers with various offers on the new Huawei P30 range. Probably one of the best offers I saw was from Mobile Phones Direct, for the Huawei P30 128GB on O2 with unlimited minutes and texts and 30GB of data (no upfront cost). For this you will pay £36pcm and get a free Sonos One speaker included (RRP £199). Via the same site the Huawei P30 Pro 128GB costs £53pcm with EE, with 50GB, unlimited mins and texts, plus the free Sonos One speaker.